I start­ed prac­tic­ing yoga about a year and a half ago. The stu­dio I attend is devot­ed to Bikram Yoga1, a form of Hatha yoga that con­sists of a pre­scribed series of 26 pos­tures and two breath­ing exer­cis­es done in a 105°F room over the span of 90 min­utes. It’s intense. One writer pro­claimed that “if Chuck Nor­ris did yoga, it would be Bikram.“2 I first went to class at the behest of my wife Veron­i­ca (a 6–8 class­es per week devo­tee), and was sure I wouldn’t like it. But I found the class’s com­bi­na­tion of men­tal and phys­i­cal chal­lenges to be com­pelling, and I’ve been going reg­u­lar­ly (more or less) ever since. I try to go to two or three class­es per week, but I haven’t always man­aged to main­tain this in the thick of the semes­ter. I say that I teach music, but a good deal of my instruc­tion could, I sup­pose, be called phys­i­cal edu­ca­tion. Play­ing the bas­soon requires the coor­di­nat­ed inter­ac­tion of more body parts than most oth­er instru­ments. All ten fin­gers must be able to move both inde­pen­dent­ly and in dozens of dif­fer­ent com­bi­na­tions; mus­cles of inhala­tion and exha­la­tion must be fine­ly con­trolled; form­ing the prop­er embouchure is crit­i­cal; tongue, jaw, and throat posi­tion all have influ­ence on the sound a play­er pro­duces; for most set-ups, the left arm must sup­port some of the instrument’s weight. And of course there are the more gen­er­al issues of pos­ture, eye con­tact, cue­ing, and expres­sive or time-keep­ing ges­tures. In the ser­vice of all of these things, I firm­ly believe that stay­ing fit is an impor­tant part of my musi­cal rou­tine. There are cer­tain­ly lots of types of exer­cise to choose from, and each offers its own par­tic­u­lar ben­e­fits. I’ve found my yoga prac­tice to be help­ful to my bas­soon prac­tice in many ways, across both the phys­i­cal and men­tal realms. I’d like to share some of the lessons or crossover skills that yoga has pro­vid­ed me. Pret­ty much all of these apply to musi­cians in gen­er­al; some of my com­men­tary is just very bas­soon-spe­cif­ic. The most obvi­ous con­nec­tion between yoga and play­ing bas­soon relates to breath­ing. The class­es begin with an exer­cise that involves slow deep breath­ing (along with sim­ple arm and head move­ments). One of the pur­pos­es of this exer­cise is to explore 100% of your lung capac­i­ty, both when inhal­ing and when exhal­ing. This is some­thing I often work on with bas­soon stu­dents — being in full con­trol of your air means under­stand­ing both the top and bot­tom lim­its of your lungs. I find that young stu­dents in par­tic­u­lar often don’t real­ly have a con­cept of what a deep breath is until I get them to fill their lungs to their absolute max­i­mum. Once they’ve felt what 100% capac­i­ty feels like, it’s usu­al­ly much eas­i­er for them to take an 85–90% breath and play with bet­ter sup­port and a big­ger sound. Even though I know the lim­its of my own lungs very well by now, the breath­ing exer­cis­es in yoga help me refine and main­tain my con­trol over my mus­cles of res­pi­ra­tion. Six of the class’s twen­ty-six pos­tures involve bal­anc­ing on one leg, often while extend­ing oth­er limbs out into space in var­i­ous ways. Although stand­ing up and play­ing bas­soon is less acro­bat­ic than many of these pos­tures, it still involves being in a some­what unnat­ur­al posi­tion with a heavy asym­met­ri­cal object alter­ing your cen­ter of grav­i­ty. I’ve found that work­ing on these pos­tures has helped me feel more secure in being mobile when I’m stand­ing up and play­ing. Every pos­ture involves var­i­ous minu­ti­ae of body posi­tion­ing: place­ment of the hands, rota­tion of the hips, angle of the feet, direc­tion of your gaze, engag­ing cer­tain mus­cles or mus­cle groups, etc. Keep­ing track of all of these things requires a very well-devel­oped sense of pro­pri­o­cep­tion (per­cep­tion of the posi­tion and move­ments of the body). This sense is also essen­tial in bas­soon play­ing. Can you tell with­out a mir­ror whether your embouchure is set up cor­rect­ly? How far your fin­gers are lift­ing above the keys and holes? Whether your left thumb is head­ed for the prop­er flick key? If you’re rais­ing one shoul­der, stick­ing an elbow out, or engag­ing in some oth­er unnec­es­sary motion as you play? In addi­tion to pay­ing atten­tion to the var­i­ous body parts engaged in a par­tic­u­lar pos­ture, part of the prac­tice of yoga is relax­ing the parts of the body not direct­ly involved. When engaged in a dif­fi­cult pos­ture, it’s very easy to let ten­sion creep into oth­er mus­cles and joints. This most often man­i­fests in the face via gri­maces, flared nos­trils, and the like. Teach­ers often give reminders to relax your face or even to smile at the most awk­ward, dif­fi­cult moments of class. The abil­i­ty to relax under pres­sure is vital to musi­cal per­for­mance, as well. 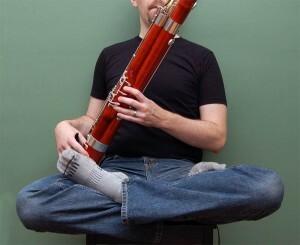 If you let ten­sion build up — par­tic­u­lar­ly in dif­fi­cult musi­cal pas­sages — you won’t play as well, and you make your­self more prone to repet­i­tive stress injuries. Also, relax­ing the fin­gers you’re not using at any giv­en sec­ond will keep them clos­er to the bas­soon, increas­ing tech­ni­cal facil­i­ty. The teach­ers explain each pos­ture as the class does them, but they do not per­form the pos­tures them­selves. And unless you’re next to par­tic­u­lar­ly advanced stu­dents, watch­ing those around you can be of lim­it­ed val­ue. Thus, your main source of infor­ma­tion about the pos­tures is the teacher’s ver­bal descrip­tion. While you’re bal­anc­ing on one foot, using your pro­pri­o­cep­tors to tell you what your oth­er foot is doing, relax­ing your face, and remem­ber­ing to breathe, you have to reserve enough brain pow­er to pay atten­tion to the teacher’s instruc­tions. They will often pro­vide cor­rec­tions once you’re in a pos­ture too, so you can’t tune out in the mid­dle. Sim­i­lar­ly, you have to be able to keep your ears open for audi­to­ry feed­back while you’re read­ing a dif­fi­cult musi­cal pas­sage, pay­ing atten­tion to your fin­ger height, relax­ing your shoul­ders, care­ful­ly man­ag­ing your air, and per­haps keep­ing one eye on a con­duc­tor. Even after a year and a half of yoga class­es, I can’t touch my toes with straight legs. My ham­strings are still too inflex­i­ble, but I’m slow­ly improv­ing. In every class there are peo­ple far more flex­i­ble than me who can reach well past their toes — even some who can touch their fore­heads to their toes. Rather than let­ting this frus­trate me, I try to have patience with myself and take the long view. Judg­ing myself based on those more advanced than me (many of whom have been prac­tic­ing yoga for far longer than I have) is unpro­duc­tive at best and depress­ing at worst. But I can take what they do as inspi­ra­tion, and con­cen­trate on mak­ing grad­ual progress. I think that every musi­cian has had the expe­ri­ence of being flab­ber­gast­ed by hear­ing some­one far more advanced per­form on their instru­ment. The best way to respond to such an expe­ri­ence is not to think “I’ll nev­er play that well,” but to think “I want to be able to do that — what can I do to work towards his or her lev­el of per­for­mance?”. Fur­ther­more, it’s easy to focus on your per­ceived defi­cien­cies while not rec­og­niz­ing the things at which you excel. For what­ev­er rea­son, I seem to be nat­u­ral­ly quite good at Rab­bit pose, the most intense for­ward bend of the entire series. I didn’t even real­ize I was good at it until my wife remarked on it. While it’s cer­tain­ly impor­tant to iden­ti­fy and work on the things you’re not so great at, it’s also good to pick out the things you already do well. This will both bol­ster your con­fi­dence and allow you show off your best qual­i­ties effec­tive­ly. Not so great at rapid tongu­ing? That’s ok — keep work­ing on it. But in the mean­time, don’t for­get to show­case that [rockin’ high reg­is­ter | vel­vety tone | fast fin­ger tech­nique | what­ev­er your strength is]. When you take your first Bikram class (at least at our stu­dio), the teacher tells you that your goal is to just stay in the room for the entire 90 min­utes. The peo­ple who laugh at the seem­ing sim­plic­i­ty of that goal are often the same peo­ple who fail to attain it. As I said above, between the heat, the dif­fi­cul­ty of the pos­tures, and the hour-and-a-half dura­tion, this class is intense. The only time I have sweat as much as I do in a Bikram class was in high school drum­line camp, car­ry­ing 30-pound tenor drums and march­ing on black­top in the noon­day sun of Ten­nessee in August. And just like in drum­line, in Bikram you are expect­ed to lis­ten, to do what you’re told when you’re told to do it, to stay focused, to remain still when you’re at rest, and to ignore the beads of sweat drip­ping down your face. Devel­op­ing this sort of focus and abil­i­ty to shut out dis­trac­tions is essen­tial in being a calm and col­lect­ed per­former. This goes hand-in-hand with my dis­cus­sion of dis­ci­pline above. Many of the pos­tures involve hold­ing very dif­fi­cult posi­tions for what seems like an eter­ni­ty. In fact, there’s one sim­ply called Awk­ward pose that involves bal­anc­ing on your tip­toes while crouch­ing with your thighs par­al­lel to the floor and lock­ing your arms straight out in front of you. The easy things to do are to either not go ful­ly into the pos­ture (half crouch, don’t go all the way up on your toes, let your arms sag, etc.) or to just quit halfway through. But nei­ther of those paths lead to improve­ment. Even when you lose your bal­ance or grip in a pos­ture, the teach­ers exhort you to get right back in and try again. The same goes for musi­cal prac­tice and per­for­mance. A tech­ni­cal pas­sage isn’t clean? Don’t gloss over it, prac­tice until it’s 100% cor­rect. Don’t break that slur for a breath — keep push­ing to the end of the phrase (you’ve explored the low­er end of your lung capac­i­ty, right?). You make a mis­take in per­for­mance? Let it go and play the snot out of the rest of the piece. As I said above, there are plen­ty of choic­es in how to exer­cise, each with dif­fer­ent ben­e­fits. Play­ing the bas­soon at a high lev­el is such a phys­i­cal act that I think it’s essen­tial to find some form of reg­u­lar phys­i­cal activ­i­ty that works for you. This form of hot yoga has worked well for me, but in the past I’ve also expe­ri­enced great ben­e­fits from swim­ming (par­tic­u­lar­ly in the realms of air man­age­ment, lung capac­i­ty, and effi­cien­cy of oxy­gen pro­cess­ing). What­ev­er you choose to do, be mind­ful about it — fig­ure out how it can help your musi­cian­ship, both direct­ly and indi­rect­ly.